For the first time, the Face Architect Bi-serum inspired by the aesthetic medecine gathers 2 exclusive formulas in one product to resculpt face’s oval. 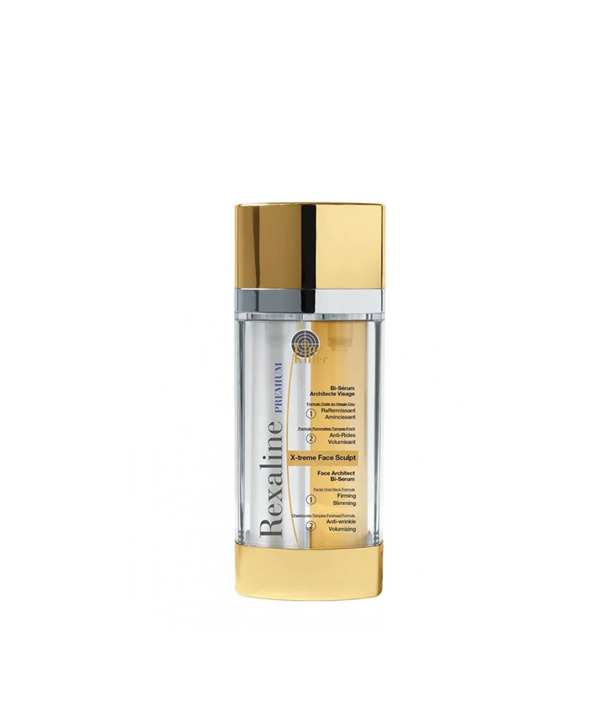 1- A Slimming Formula enriched with Glaucine and Peptides, dedicated to the lower part of the face (oval of the face and neck) to redefine, slim and lift facial contours. 2- A Volumizing Formula enriched with Peony extracts, dedicated to the upper part of the face (cheekbones-temples-forehead) to reduce wrinkles and fine lines, replump and densify the skin. Glaucine and Peptides intended for use on the lower part of the face (throat and neck) to redefine, shape and lift the contours of the face. - A Volumizing Formula enriched with Peony extract, intended for use on the higher parts of the face (cheekbones - temples - forehead) to reduce wrinkles and fine lines, plump up the skin and restore its density.Both formulas contain two exclusive complexes: - The “DWK Complex”, a blend of anti-wrinkle and firming active ingredients that targets the cells responsible for skin ageing. - The Rexaline Complex that offers surface and deep hydration, plumping skin up and restoring its density.